Want a tailgating space with a tent for your group of up to 12 or 14? These Tailgating spaces come with a 10×10 tent and accommodate 1 car. Guests may park for Free in General Admission and take the Free shuttle to the designated drop off closest to your tailgate. Vehicle restrictions apply. Comes with a 10×10 tent situated one row off the rail and behind Meadows Rail tailgating. There are 3 designated viewing areas along the rail for patrons in Meadows Back Row to watch the races up close. Your package comes with 1 parking pass to park 1 vehicle at your tent, and 2 General Admission badges. It is centrally located and an easy walk to Brooklandwood Village, pony rides, the Parade Ring, and Jack Russell Terrier races. There is a festive feel in the Meadow as Meadows Back Row and Meadows Rail patrons mingle. Meadows Back Row accommodates a maximum of 14 people per space. Additional guests over 12 years of age must purchase a GA badge. Children 12yrs and under are free but count in the maximum of 14 per space. You have the option of purchasing Green Spring Parking for your guests. The Green Spring Lot is just a 2-minute walk to the Meadows entrance. No patron-supplied tents, awnings, canopies or umbrellas are allowed. Vehicle restrictions apply. No vehicles taller than 7ft or longer that 30ft may enter the Meadows tailgating area. Located on the outside rail with most being on the backstretch. Valley View provides some of the best viewing of the races. It comes with a 10×10 tent right on the rail so the horses thunder past your spot. It is especially great for people who are happy to hang out at their tailgate as it can be a bit of a walk to the crossings, which take you to the infield where the Jack Russell Terrier races, pony rides and Brooklandwood Village are. Valley View tailgates accommodate a maximum of 12 people. Additional guests over 12 years of age must purchase a General Admission badge. Children 12yrs and under are free but count in the maximum of 12 per space. Vehicle restrictions apply. No vehicle taller than 7ft or longer than 30ft will be allowed access to Valley View. Want a prime homestretch space on the rail that includes an umbrella table for your group of up to 14? These Tailgating spaces come with an umbrella table and accommodate 1 car. Guests may park for Free in General Admission and take the Free shuttle to the designated drop off closest to your tailgate, or you may purchase VIP parking for your guests. This is considered the premier tailgate area. Located on the inside rail at the finish where horses thunder past your spot with views of the backstretch as well. It is conveniently located to all activities, and is adjacent to the Parade Ring where the horse saddle up and the hat contest takes place. It is close to the finish line where the trophies are awarded and the Opening Ceremonies take place. This package comes with 1 parking pass to park 1 vehicle at your space, and 2 Paddock badges. All your guests must have a Paddock badge and additional badges must be purchased by the Paddock tailgate holder. Also comes with a 9ft umbrella and a 5ft table with white linen. Paddock accommodates a maximum of 14 people per space This is a restricted access area so all patrons must have and wear a Paddock badge at all time (excluding infants that are not mobile). You have the option of purchasing VIP Lot AA parking for your guests. Lot AA is a 5-minute walk to the Paddock entrance. Vehicle restrictions apply. No vehicle higher than 7ft or longer than 30ft will be allowed access to this area. Located on the outside rail at the “top of the home stretch” It is conveniently located to all activities. Your package comes with 1 parking pass to park 1 vehicle at your space, and 2 General Admission badges. This comes with a 9ft umbrella and a 4ft table with white linen. There is a festive feel in the Meadows as Meadows Back Row and Meadows Rail patrons mingle. Meadows Rail accommodates a maximum of 14 people per space. All your guests over 12 years of age must purchase a General Admission badge. You have the option of purchasing Green Spring Parking for your guests. Green Spring Parking is just a 2-minute walk to the Meadows entrance. Vehicle restrictions apply. No vehicle higher than 7ft or longer than 30 ft will be allowed access to the Meadows. Want a PREMIER tailgating space in the Infield to accommodate up to 12? These Tailgating spaces accommodate 1 car. Guests may park for Free in General Admission and take the Free shuttle to the designated drop off closest to your tailgate or you may purchase VIP parking for your guests. Located on the bottom row of the Infield Tailgating hill just below the Crest, Wither is a single row of tailgate spaces. Although not on the rail, it provides an amazing panoramic view of the grounds and racing. It is conveniently located near the Jack Russell Terrier races, Brooklandwood Village, and the pony rides and is a short walk to the rail to watch the racing up close. It is in the infield so there is a festive atmosphere but also has a view. Children 12yrs and under are free but count in the maximum of 12 per space. All your guests over 12 years of age must purchase a General Admission badge. Vehicle restrictions apply. No vehicle taller that 7ft or longer than 18ft will be allowed access. Located at the top of the Infield Tailgating hill just above the Crest, Old Hilltop is one row of nose-to-nose tailgate spaces and is a popular spot because of the grove of trees. These do not provide shade for the car but a spot close by to set up a picnic out of the sun and from where one can see some of the racing. It is conveniently located to the Jack Russell Terrier races, Brooklandwood Village, and the pony rides and is a short walk to the rail to watch the racing up close. It is in the infield so there is a festive atmosphere. Children 12yrs and under are free but count in the maximum of 12 per space. Everyone over 12 years of age must purchase a General Admission badge. Vehicle restrictions apply. No vehicle higher than 7ft or longer than 18ft will be allowed entrance. Want tailgating spaces for festive or family-oriented environments? These tailgating spaces are both in the Infield with two distinctive differences: The Crest is nose-to-nose tailgating with a festive atmosphere, while the Croup is for families with young children who don’t want to be in a party environment. These 3 rows of nose-to-nose tailgate spots in the Infield are the least expensive tailgate option, are centrally located, have a festive atmosphere, do not guarantee viewing of the racing, accommodate 12 people, and offers the purchase of VIP parking to make it easy on your guests. No tents or umbrellas are provided or allowed in these 3 rows of nose-to-nose tailgates. It is centrally located and an easy walk to Brooklandwood Village, pony rides, and the Jack Russell Terrier races. There is a festive feel as these spots are close together and patrons tend to mingle. Children 12yrs and under are free but count in the maximum of 12 per space. All guests over 12 years of age must purchase a General Admission badge. You have the option of purchasing Green Spring Parking for your guests. The Green Spring Lot is about a 5-minute walk to the Crest. Vehicle restrictions apply. No vehicle higher than 7ft or longer than 18ft will be allowed access. This single row of tailgating in the Infield just below the Withers is designed for families with young children who want to be removed from the party atmosphere of the other Infield options. 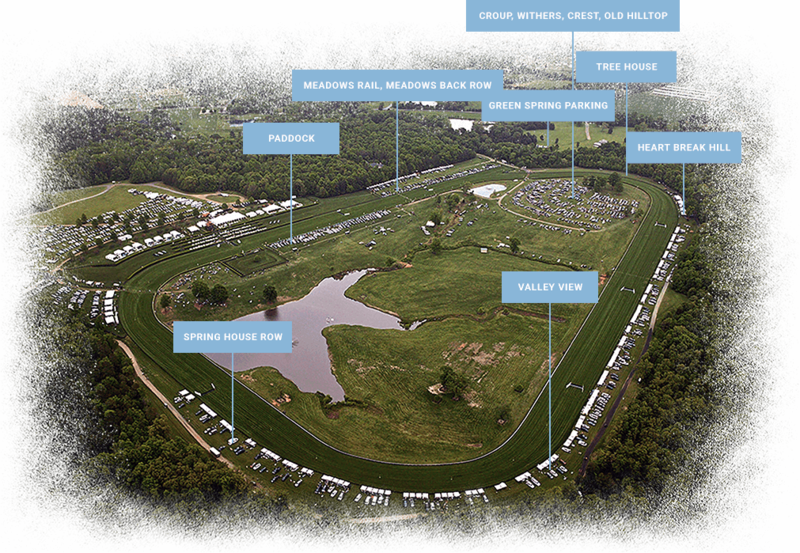 It is centrally located, has a panoramic view of the grounds and racing, accommodates 12 people, and offers the purchase of VIP parking to make it easy on your guests to get to your tailgate space. Your package comes with 1 parking pass to park 1 vehicle at your space, and 2 General Admission badges. Children 12 and under are FREE and do not need a badge. Located just below and across the road from the Wither, the Croup is a single row of tailgate space. The Croup is not on the rail but provides a panoramic view of the grounds and racing. It is adjacent to the Jack Russell Terrier races, and convenient to Brooklandwood Village, the pony rides and is a short walk to the rail to watch the racing up close. You have the option of purchasing Green Spring Parking for your guests. The Green Spring Lot is just a 5-minute walk to the Croup.